It's not as a result of genetic modification or some weird scientific experiment gone wrong, but if you come to Great Yarmouth on holiday this year, then you'll probably wonder how the local seagulls have managed to turn into such big monsters. You'll spot these feathered giants hovering around the market chip stalls and loitering near the fish and chip stands down on the seafront. And if you buy yourself a portion of chips, you'd better hold onto it tightly, because these terrifying creatures will think nothing of ripping a whole battered cod straight out of your grasp. And then they'll come back for your mushy peas and chips! And you watch - they'll just wolf it all down in one gulp. 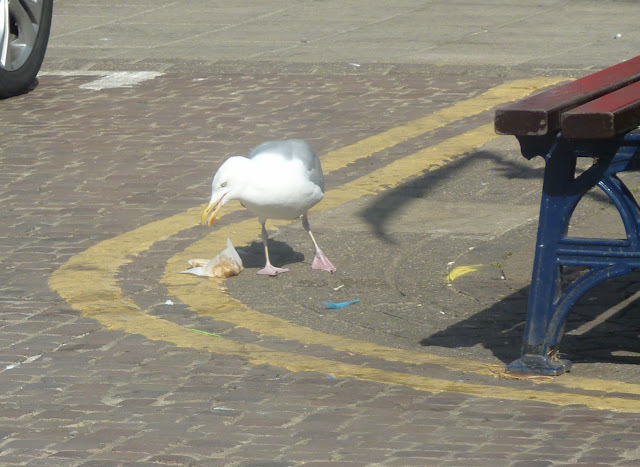 The killer seagulls of Great Yarmouth have been terrorising the locals for two or three years now, stealing their chips and slowly growing bigger, fatter, stronger and more menacing in the process. And even though eating outside has become a matter of taking one's life in one's own hands, still both locals and holidaymakers alike brave these bionic birdies! In fact, the marketplace swarms with human chip munchers every single lunch time, and quite often till late in the afternoon. And always there's the fearsome presence of the seagulls waiting to pick up the scraps. Their appetite for chips is endless. It is almost like they've developed an addiction to the things. So, be warned! If you don't like the thought of being attacked by hungry seagulls, then only eat fish and chips indoors. And if you are eating them outside, do not give into bullying - and please, under no circumstances, feed these creatures. Because if you do, they will only grow bigger and stronger - and eventually they will take over the world. Amd that's the last thing we need in Great Yarmouth right now - the seagulls running everything!